The Islamic State of Iraq and the Levant , also known as the Islamic State of Iraq and Syria , Islamic State , and by its Arabic language acronym Daesh ">[ˈdaːʕɪʃ]), is a Salafi jihadist unrecognised state and militant group that follows a fundamentalist, Wahhabi doctrine of Sunni Islam. Its adoption of the name Islamic State and its idea of a caliphate have been widely criticised, with the United Nations, various governments, and mainstream Muslim groups rejecting its statehood. Note: Iraq and Syria contain large desert areas with limited populations. These areas are mapped as under the control of forces holding roads and towns within them. 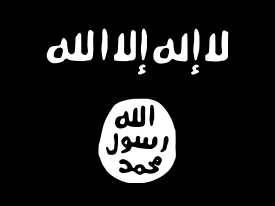 The Islamic State of Iraq and the Levant (ISIL, /ˈaɪsᵻl/), also known as the Islamic State of Iraq and Syria (ISIS, /ˈaɪsᵻs/), Islamic State (IS), and by its Arabic language acronym Daesh (Arabic: داعش‎‎ dāʿish, [ˈdaːʕɪʃ]), is a Salafi jihadist unrecognised state and militant group that follows a fundamentalist, Wahhabi doctrine of Sunni Islam. Its adoption of the name Islamic State and its idea of a caliphate have been widely criticised, with the United Nations, various governments, and mainstream Muslim groups rejecting its statehood. This group has been designated a terrorist organisation by the United Nations and many individual countries. ISIL is widely known for its videos of beheadings of both soldiers and civilians, including journalists and aid workers, and its destruction of cultural heritage sites. The United Nations holds ISIL responsible for human rights abuses and war crimes, and Amnesty International has charged the group with ethnic cleansing on a "historic scale" in northern Iraq. ISIL originated as Jama'at al-Tawhid wal-Jihad in 1999, which pledged allegiance to al-Qaeda and participated in the Iraqi insurgency following the 2003 invasion of Iraq by Western forces. The group first proclaimed itself a worldwide caliphate and began referring to itself as Islamic State (الدولة الإسلامية ad-Dawlah al-Islāmiyah) or IS in June 2014. As a caliphate, it claims religious, political and military authority over all Muslims worldwide. ISIL gained prominence in early 2014 when it drove Iraqi government forces out of key cities in its Western Iraq offensive, followed by its capture of Mosul and the Sinjar massacre. In Syria, the group has conducted ground attacks on both government forces and opposition factions. By December 2015, the Islamic State covered a vast landlocked territory in western Iraq and eastern Syria, with a population estimate of 2.8–8 million people, where it enforces its interpretation of sharia law. ISIL is now believed to be operational in 18 countries across the world, including Afghanistan and Pakistan, with "aspiring branches" in Mali, Egypt, Somalia, Bangladesh, Indonesia and the Philippines.